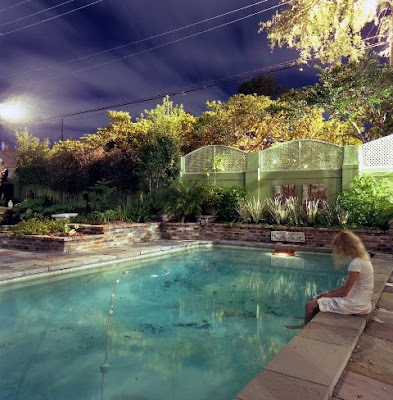 For the past five or more years, a pair of great horned owls sat each morning at the edge of our pond-like pool in Carmel, California and watched the sun rise. I squinted at their silhouettes, side-by-side and sometimes touching, stronger as reflections in the water than the hazy outline of their bodies against the valley. Occasionally I tried, ever so softly, to open the screen door and take a picture, but each time they spread their wings at the noise, landing separated in the branches of our lace oaks or on the peeks of our modern, oversized ‘cabin’ in the woods, sending me running in the early morning light from window to window in search of another glimpse. My cousin Timber Wolfe, perhaps influenced by his name, reminded me recently that the great horned owls eat the bunnies, small foxes and birds that also call this place home. “The owls are predators,” he said. Yet he failed to lessen my romantic sentiment, even after yesterday’s related incident, as I watched a hawk send a covey of quail from our fountain to safety beneath the bushes, where they stood as still as statues for what seemed like hours. 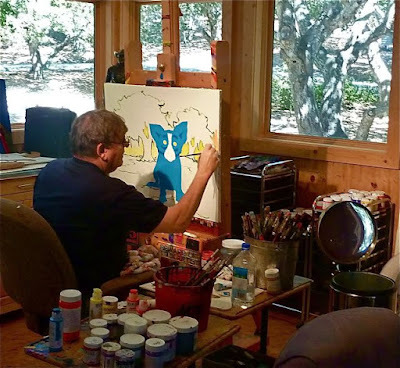 George, who paints all night and sleeps until noon, missed the owls for years. “Take a picture!” he said, frustrated with my failure as a nature photographer. This summer things changed with the owls. In the first weeks none appeared; but it was foggy, and I assumed they chose another spot from which to view the morning light. After some time, however, I heard the hooo-hooo for an hour or more each morning, sometimes waking George, so that we discussed the possible reasons for this sad cry. 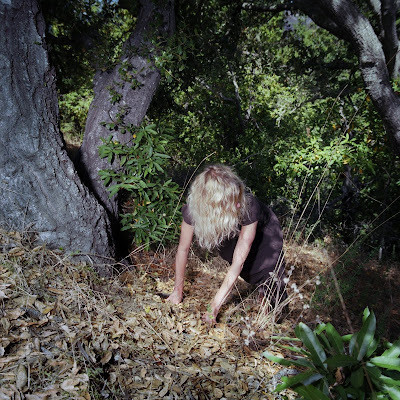 Yet even as we scanned the water’s edge, the branches, and the roof, we couldn’t spy the source. 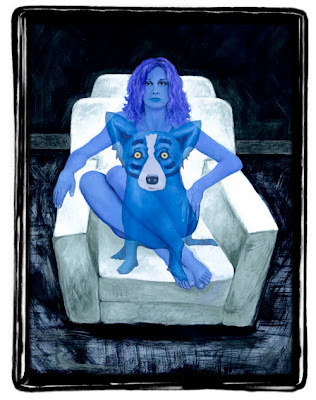 This week we watched a movie about muses and artists and love affairs called Bride of the Wind (2001). It was twenty years ago that a similar movie, Impromptu, reflected, in a way, the impromptu shift in my life’s course. I had returned from Vienna only three years before, and it was there that I contemplated Gustav Klimt’s Adam and Eve, a painting I visited dozens of times over many months while musing about my destiny. 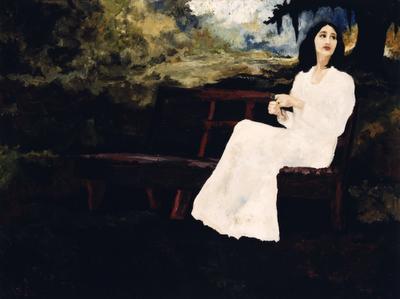 Impromptu (1991), based on the real life love affairs and friendships of author George Sand (a woman who posed as a man so that she would be taken seriously as a writer) with composers Frederic Chopin and Franz Liszt, poet Alfred De Musset, and artist Eugene Delacroix, inspired the hopeful muse within me, as though I were twelve years old again, imagining that my knight climbed the long locks of my hair to reach my tower prison. 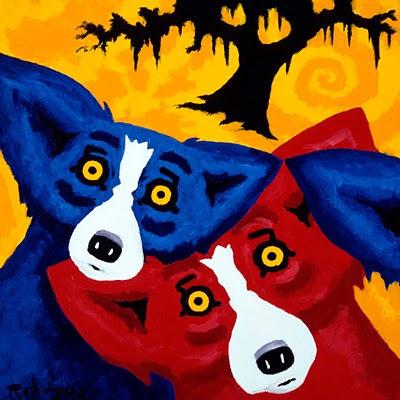 This was also the year I took a chance and went to work for the Rodrigue Gallery of New Orleans. 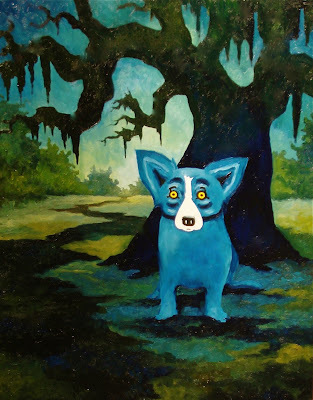 It was the year I met George Rodrigue, the year my life changed forever. 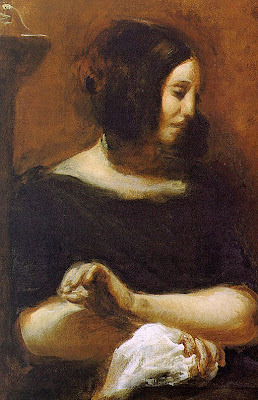 I spent much of 1991 and 1992 reading the complete works of George Sand, as I listened to Chopin’s preludes and etudes, immersing myself in this real-life fairytale. 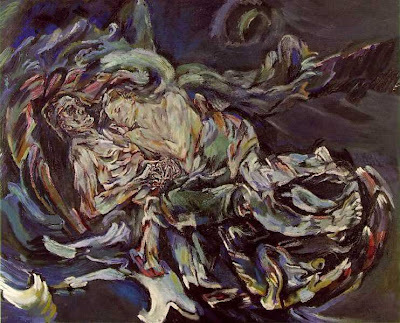 Similarly, I have a history with the artists in Bride of the Wind, a movie based on the true story of Alma Mahler and her love affairs with composer Gustav Mahler, architect Walter Gropius, and artist Oskar Kokoschka. She lived in that same inspired world, the one that transported me as a college student (through Adam and Eve) to Fin de Siécle Vienna. In 1988 my Viennese professor teaching Austrian Art and Architecture claimed to have had a long-running affair with Kokoschka. During her classes I struggled to retain the academic lessons while daydreaming about the romantic ones. 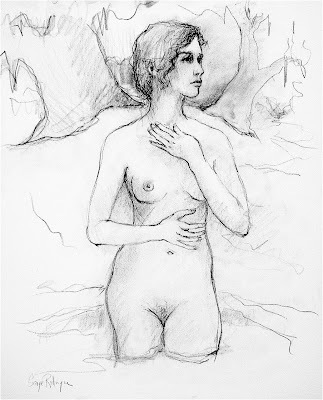 It was this notion of ‘the lover of a great artist’ that intrigued me. What on earth must it feel like to be a muse, to affect a creative soul in such a way that their personal expression involves you and remains as such forever? I leave that question unanswered here, not because I don't know the answer, but because it confounds me, and I am without the words. This morning George came into the bedroom from his studio after painting all night. We stood at the window and watched the sunrise. “There’s only one owl,” I whispered. “Maybe they split up,” he said. But we both knew better. 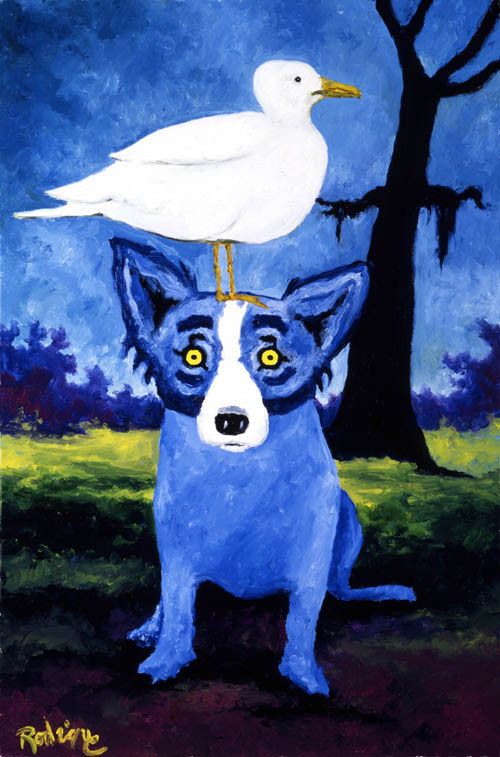 After more than forty years and thousands of paintings, it is the dog-in-a-landscape that stands out as George Rodrigue’s most popular subject. ...and later, the spirit of a studio dog on a journey to find her master. 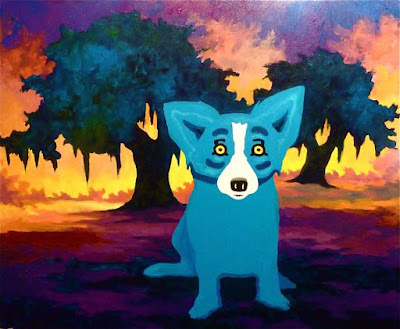 Yet throughout these changes, from the Cajuns to Blue Dogs to Hurricanes and Bodies, George Rodrigue holds on to Louisiana through the Oak Tree. 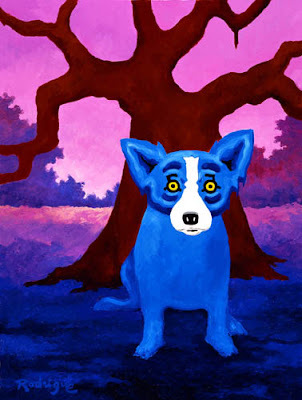 Like the Blue Dog, from the beginning the Oak Tree is a well-defined, hard-edged shape particular to Rodrigue. 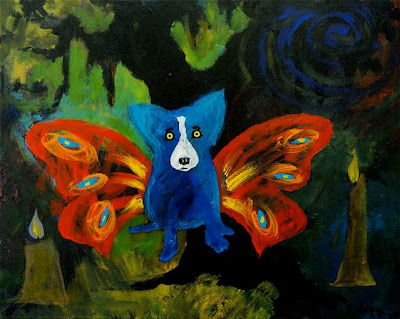 He paints the dog not as a small animal at a person’s feet, but rather as a person itself, large-scale and eye-level. 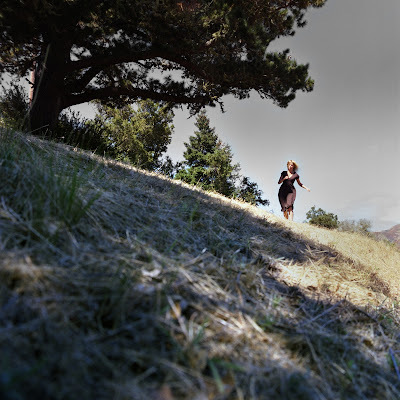 The Oak Tree also has specific and unusual characteristics, such as its foreground location and its odd shape, cut off at the top, rather than the background location and birds-eye view of traditional landscapes. George pieces the dog and tree together like a puzzle, almost as if the tree locks the dog into place. 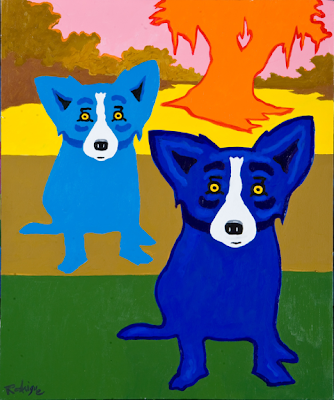 In the abstract works of 2001-2003, the Oak Tree, although not as consistent a subject matter as the dog, is just as stylized. 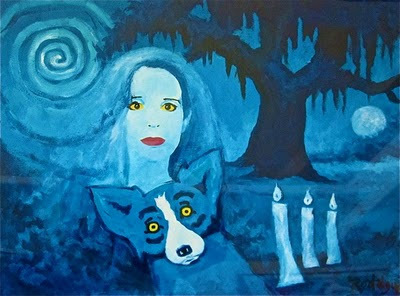 Similarly, both the Blue Dog and the Oak Tree splinter, as if in search of definition (and a hard edge) in the post-Katrina paintings. 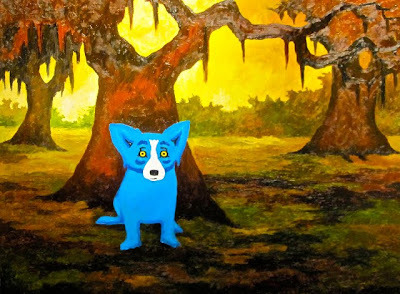 As with George’s Cajun paintings, these dog-in-a-landscape canvases are more popular, ironically, outside of Louisiana than within the population that, like George, has oak trees in its backyard and grew up with stories of the loup-garou. 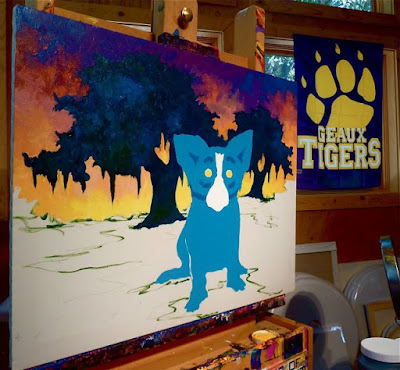 I’ve heard George say many times that his Cajun paintings are most popular among a non-Cajun audience, one that in many cases never lived in Louisiana nor (certainly in the 1970s) heard the word ‘Cajun.’ According to George, this has to do with how he paints and how he interprets his world. His style is unique and well-defined, and this ensures his longevity and his wide appeal, beyond his regional subjects. 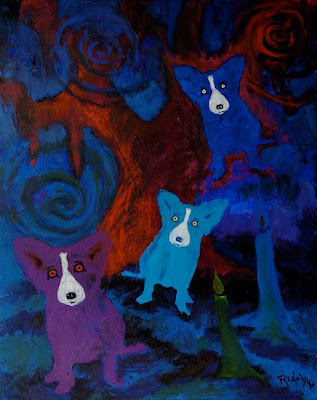 Several years ago, inspired by the Bodies series and a new water-based oil paint, George approached his landscapes in oil for the first time since his necessary switch to acrylics some twenty years ago. He could hardly wait to revisit this classical subject with these paints, and the result is rich and full of depth, a quality more difficult to achieve in the fast-drying acrylics. 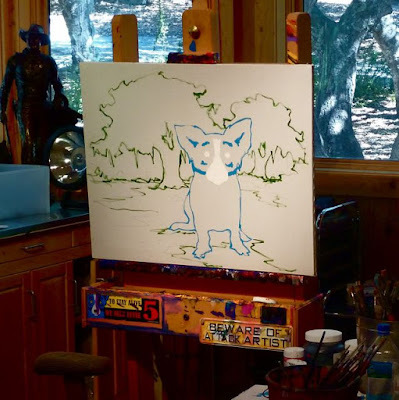 Today George continues to paint the dog in a landscape. 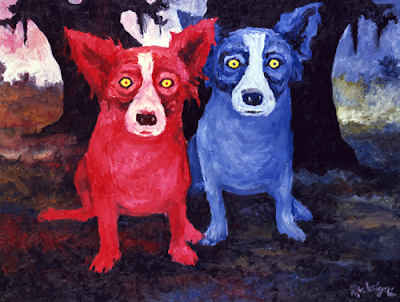 However, as is typical of his recent work, most pieces are bright colored, in acrylic paint, and large scale. 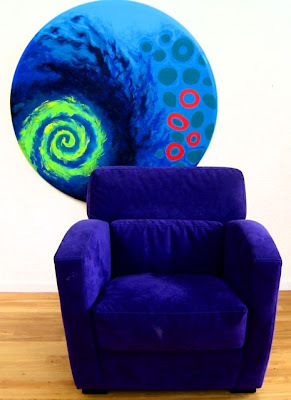 There is little that resembles an actual landscape, and indeed the paintings, although the titles occasionally suggest otherwise, do not reference any place in particular. 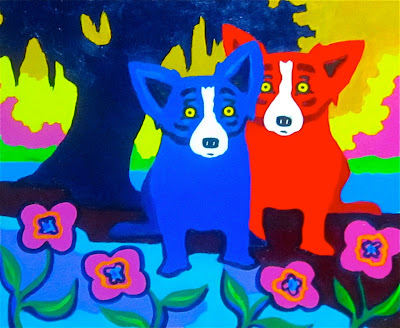 Acrylic paint provides George with the neon colors and abstract, hard edges that he desires most on his canvas today. These are a long way from the black oaks of the late 1960s and early 1970s (See the post "Early Landscapes" for images). But isn’t that how it should be? 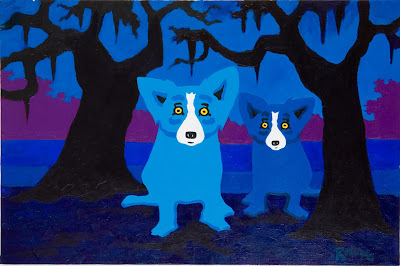 It’s true that after forty years, George Rodrigue still paints the Oak Trees. 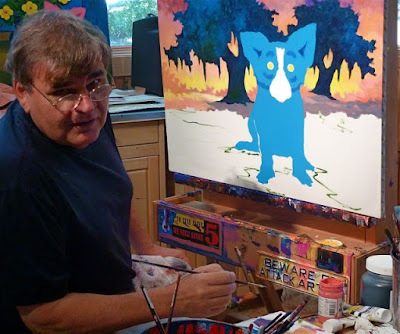 And after twenty-five years, he still paints the Blue Dog. (The same can be said for Jolie Blonde, a subject since 1974.) 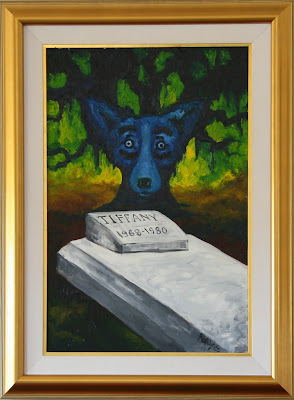 However, neither subject as painted today could be mistaken for its earlier counterpart. It’s an ironic statement coming from an artist associated so strongly with repetitive imagery. 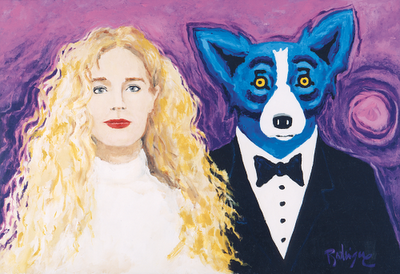 Indeed he chose specific subjects, stylized them, and painted them over and over, ever since his first exposure to Pop Art in Los Angeles while at Art Center. And yet, if you’ve followed his work since 1967 (or even this blog over the past year), then you know that George’s words are true. I mean, how many thousands of landscapes by thousands of artists exist in the world? 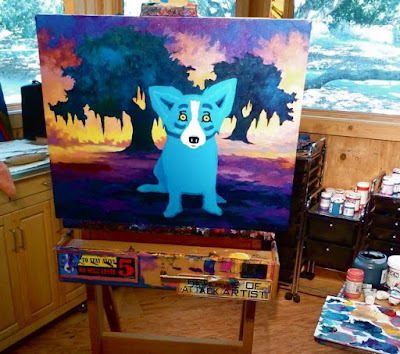 How many paintings of dogs? 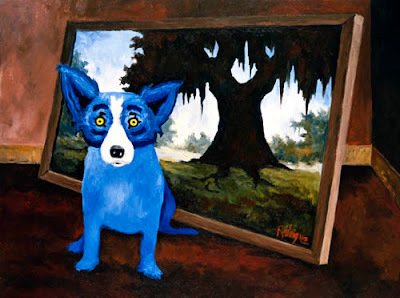 And yet, George Rodrigue’s are unique to him. There is nothing redundant about them; nor, even as he’s grown and changed on his canvas, would they be mistaken for someone else’s work. 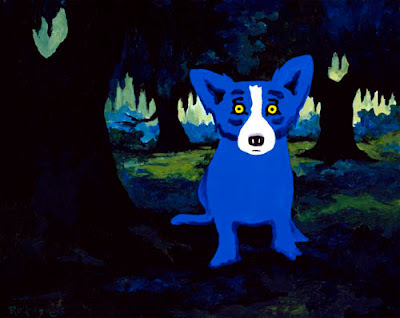 ...and, judging by the on-going wait list for paintings of a 'Blue Dog in a Landscape,' exciting for the rest of us as well. 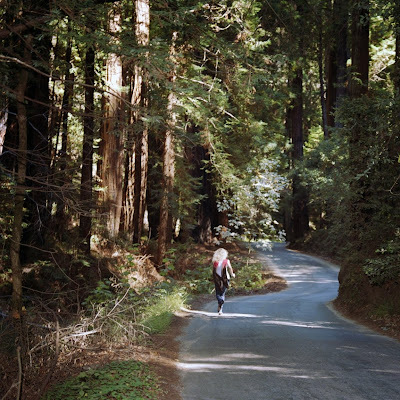 For the unedited post, including images, visit here. Viewer discretion is advised.